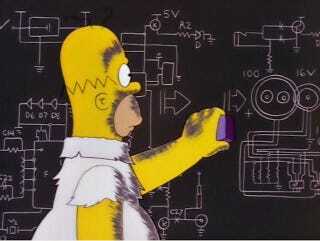 How Close Was The Simpsons To Figuring Out the Mass of the Higgs Boson? Given the time it happened and, you know, that he's a cartoon, the answer is that Homer Simpson did come pretty close to figuring out the mass of the Higgs Boson before scientists did. This is from the episode "The Wizard of Evergreen Terrace," which aired on September 20, 1998. The episode has Homer realizing that his life's half over and he hasn't accomplished anything. In order to fix it, he tries to emulate his hero (for this episode) Thomas Edison. David Kaplan, particle physicist at John Hopkins University, tells the Los Angeles Times that the result of Homer's calculation is 777 gigaelectronvolts (GeV.) Which is a bit off from the number the team at the Large Hadron Collider eventually found: around 125 GeV. The final term in Homer's equation is the square root of "hc" divided by "G." Presumably, "G" is the universal gravitational constant, "c" is the speed of light, and "h" is Planck's constant. If Homer had used a variant called the reduced Planck's constant (which divides "h" by 2 pi), the answer to the equation would have been about 310 GeV, Kaplan said. Homer would have done even better if he hadn't made pi the first term in his equation, Kaplan added. Without it, he'd have had "a nice guess of 99 GeV, which would not have been too shabby," he said. It's always nice to see that the people making our entertainment aren't just making up gibberish and that they're actually doing some legwork. Remember, there are even jokes that can make you smarter. Although, in universe, it's a little upsetting to realize that Homer could do this with just a bit of inspiration and effort.